Emmy Award-winning American television sportscaster and former college and professional football player. “I was born deaf in my right ear and have reduced hearing in my left ear. I also was very nearsighted in both eyes (-8.00 diopters). It was always a struggle to see and to hear before my LASIK surgery. I came in with a friend and we both met with the doctors here at MidWest EyeCenter. We both moved forward and had LASIK surgery on the same day! LASIK has been the best gift I have ever given to myself. Dr. Schneider offered me the chance for the Custom treatment. My husband and I were not sure that we could afford the extra fees at the time, but decided to listen to Dr. Schneider. My husband told Dr. Schneider to “give me the best possible treatment”. The staff was wonderful, comforting and caring. They even gave me Seymore (the bear) to hold during my procedure. I can remember reading the letters and numbers on our VCR and was so happy, I cried. I have enjoyed star gazing as my night vision is also perfect. I actually can see better now than I could ever see even with my glasses! I do not have glare or halos at night, so night driving is great. I can enjoy the beach and outdoor activities without fear of losing my glasses or not seeing what I want to see! 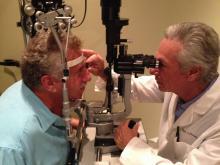 I am deeply thankful to Dr. Schneider and his staff for my vision results. If anyone is considering LASIK Vision Correction, it is the absolute best gift you can give yourself. The whole experience is life changing in more ways than you can imagine. In my opinion, there is not a better place to be than in the hands of MidWest EyeCenter. “I was legally blind and have worn glasses since I was six years old. I could not do anything without my glasses. Even now, 10 years later, I am still ‘moved to tears’ about my vision. I am able to live completely without any glasses. Dr. Schneider gave me monovision and I do not need readers, so I am totally free from any glasses! Dr. Schneider is a real blessing to me and I continue to recommend him to my family and friends. I am here today with a friend having cataract surgery with Dr. Schneider. He is one of the best doctors around. I chose David M. Schneider, M.D. to do my eye surgery for cataract removal. He recommended the Multi-Focal Lenses for both of my eyes. I am thrilled about the results. I can read the smallest print, including my cell phone, menus and even the printout from the pharmacy where I purchase my medications. I have not had an issue with reading anything! As far as my distance…… I can see forever!! I would recommend Dr. Schneider to all of my friends and relatives. I even recommend Dr. Schneider to all my ex-wives and old girlfriends for their eye care. 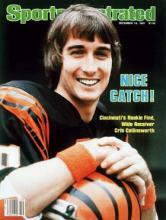 Local radio host and NBC-TV sportscaster, tight end and wide receiver for the Bengals from 1968-1977. 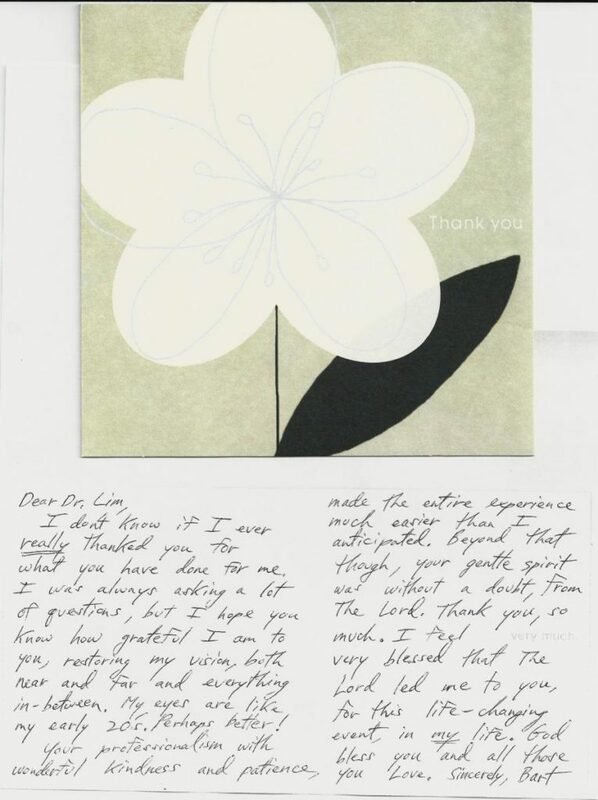 I am writing to say “Thank You” for the successful cataract operations you performed on my eyes earlier this year. I am now about six months removed from the surgeries and I am able to read without my glasses at least 95% of the time. It seems as if my ability to read in lower lighting conditions continues to improve even today, though the changes are incremental and barely noticeable until I realize I am reading in lighting that was more challenging even weeks before. I had originally planned on this being a letter to report my progress, but was embarrassed to find the letter I had written back in April had not been sent. So please accept my apology for this delayed thank you. 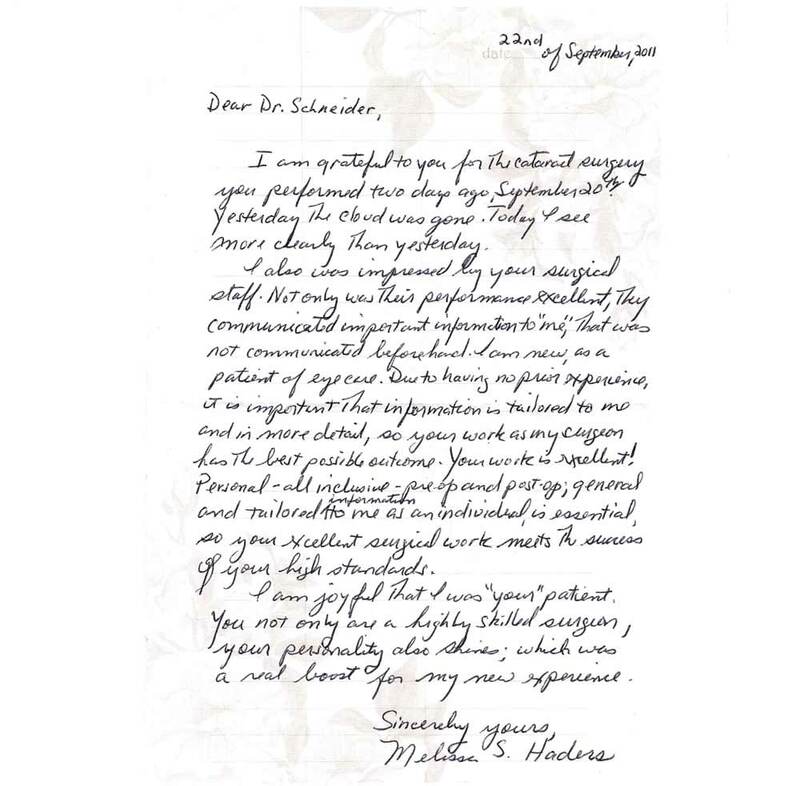 While I appreciate your skills as a surgeon and the technology that makes such dramatic improvements in sight possible, I am equally impressed with the quality of your support staff who contributed to the success of my operations. Your Eastgate staff is friendly, professional, courteous and compassionate. I especially appreciate how one of them sat with my wife during the surgery, explaining each step as she watched you on the television monitor. It was very reassuring to her. One’s eyesight is one of the most treasured of our senses and the thought of an operation on my eyes created a certain amount of anxiety. Your staff put those fears to rest in the way they educated and prepared me for surgery. Your confident manner and reassurance the morning of the surgeries was very comforting. My adjustment to living without glasses has unfolded exactly as you had predicted. My distance and mid-range vision improved immediately. The light sensitivity gradually evolved from very sensitive to normal both in bright sunshine and at night while driving. As you had cautioned me, the near vision took longer. At first that was frustrating, especially since the mid and long distance vision improved so fast. It seems as if the near distance continues to improve. I try to refrain from using my 2X cheaters in low lighting situations to try and force my eyes and brain to work together. For instance, as I type this letter on my computer screen early in the morning, it is not as easy to read as it would be with the cheaters, but I can still read the text, though it is not crystal clear. It has been wonderful working outside without having to stop and wipe off my glasses. I am really looking forward to working outside in the cold weather without having my glasses fog up. There is one “problem” I am still wrestling with that I really hadn’t thought about. After almost 50 years of wearing glasses, I still reach to take them off before I wash my face, take a shower or wipe sweat from my face. I still reach for them in the morning when I get out of bed, sometimes thinking I have misplaced them. This is a good “problem” to have. I’m confident it will not take 50 years to adjust. Thank you for using your skills as a surgeon to dramatically improve my eyesight. Please thank your staff for their kindness, professionalism and support. You make a great team. P.S. Whenever anyone asks about my eyes, I recommend they give MidWest EyeCenter a call. Words cannot express my gratitude and appreciation for you having restored the beauty of the world to me! Even though it’s just one eye for now, I cannot believe the joy I have experienced in rediscovering color. My orange tabby cats are not just orange, they are vibrantly orange! The colors of quilts I made years ago leave me nearly speechless! I feel like a child on a mission to see everything I can as quickly as I can. You gave me the BEST Christmas gift of all and I truly thank you! I can hardly wait until I see you January 30th, when you’ll restore clear vision to my left eye. I am finding it hard to imagine how I’ll be February 1st. If I puddle up over my restored sight in one eye now, I’ll probably be a blubbering fool! God bless you beyond measure and I wish you and your staff a most Happy New Year!